The Fire burned the intersection of the Dripping Springs and Palomar-Magee and burned north to just above the second set of switchbacks on the Drip trail and burned east approximately 1 to 1 1/2 miles on the Palomar-Magee. It also burned out the blowdown that had fallen across the Palomar-Magee trail. I started hiking at 4:00 p.m., with the temperature a pleasant 76-79° in various places in the campground. On this day, the Temecula high was only 83°, much cooler than the typical high in the 90s of the past several months. The hike was so pleasant that I wished I had started earlier, so I could have gone farther. The campground, as usual, has a wider variety of flowers than the trail itself. Plants specific to the campground in bloom were: matchweed, slender tarweed, an unknown matchweed type flower with a sunflower leaf, telegraph weed, and a mustang mint relative. Along the trail, the California buckwheat was mostly in the brown phase, but California aster and goldenbush (common hazardia) were just beginning to bloom. There were green berries on the honeysuckle. I carefully noted each switchback on the eight switchbacks immediately below tick heaven, since I had a GPS receiver with me for the first time since SA was turned off. The GPS actually did a pretty good job recording the trail in those switchbacks. I picked up trash along the trail, and pruned one chamise sticking into the trail between switchbacks 5 and 6. Bugs overall were minor - a distinct pleasure and large change from my last experience on this trail! I hiked from 1:30 to 6:15 p.m. The temperature ranged from 74-80°. Blooming in the campground were telegraph weed, fields of matchweed, an unknown 6" high 5-petal yellow flower, an unknown 3" high purple 11-petal flower, and California aster (e). On the trail, poison oak and squaw bush had red leaves, virgin's bower seeds were in their full glory, a goldenbush (pine?) was blooming, and bird's beak and common hazardia were ending their bloom. Everlasting still had its dried flowers, and sugar bush buds were swelling. I pruned from mile 2.4-2.6 on the switchbacks. Gnats are pretty bad when I stopped here, and terrible when I stopped at the stream crossing to rest. I picked up a full sandwich bag of trash, including one shotgun shell near the Wild Horse Trail intersection. I hiked from 10 a.m. to 5 p.m. on this cool, clear day. Although the temperature was 70° for the first mile, it quickly cooled down to 62-65° at 11 a.m. at 2200', and stayed in that range until about 1 p.m. at 4000'. It then plummeted to 52° by 2 p.m. at 4200'. On the trail, matchweed, California buckwheat, common hazardia (only above 3000'), and a 4-10' high goldenbush (Ericameria parishii?) were all ending their bloom. However, twiggy wreath plant was in full bloom, and the buds were swelling on sugar bush. The everlasting has now largely lost its dried flowers. The trail is still clear through the ceanothus just above the first stream crossing. However, just before the top of the second ridge, at mile ~5.1, the three trees that fell across the trail earlier this year have now descended farther onto the trail. (The brush was holding them up earlier.) One of those trees has three 7" diameter trunks that block the trail, requiring one to go through or over them. I suspect a horse could not get through. Just beyond the next stream crossing at mile ~5.7, the trail was nearly completely blocked by overgrown branches. I pruned the trail for about a half mile, removing the worst branches on the trail. One section here was marked by orange tape with the words "Cut out dips", for the trail crew to come soon. From the end of my hike, I could clearly see that the top of the trail was burned, but couldn't tell how far down the burn extended. Maybe next time I'll make it to the top. No bugs troubled me at all. I filled a sandwich bag with trash, with most coming from the bottom reaches, but still a surprising amount from the higher parts. I wrote this up on 1/2/01, so the details for this trip are a bit hazy now. The maximum temperature was 72° at 11:05 a.m. at the White Horse Trail Junction, dropping to 63° at the stream crossing at 1:00 p.m. Bugs were non-existent. Flowers still blooming, but ending: California aster, matchweed, and twiggy wreath. Sugarbush and manzanita have buds, holly-leaf cherry still has red-brown berries. 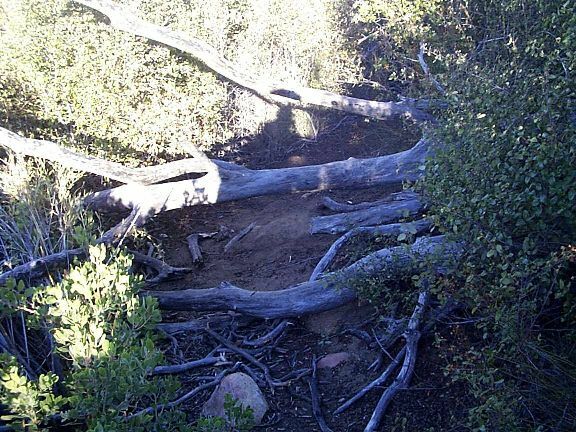 The downed giant manzanita at mile ~5.1 is still blocking the trail. I explored the "blocked-off trail" that appears to goes on the other side of the ridge at mile ~4.1, and found that it quickly peters out. You can use this short section to easily get to the top of the ridge just 10' above the main trail, which gives a good view of High Point and the 200" telescope dome. This is the first time I had actually noticed the 12' manzanita trees and 20' ribbonwood trees that had survived the 1990 fire. There are at least 20 such trees that are over a century old, which are found about one mile above the stream crossing. There is even a ~20' manzanita in the Dripping Springs Campground just north of the trailhead that I had also missed before. It was just too large for me to pick it up as something that was unusual! I met a trail crew at the bottom who were ~2/3 finished brushing the Wild Horse Trail from Crosley Saddle back to the intersection with the Dripping Springs Trail. They plan to take a month off, and then begin brushing the Dripping Springs Trail. Yay! Per usual, I filled a sandwich bag with trash, and carried out several bottles from the lowest part of the trail. I also carried out a piece of clothing, which was still on the trail as I passed it again at dusk. If you can identify it, you can claim it. My 9 year old, Matt, joined me for this hike, from 1:05 to 4:24 p.m. We saw more people on the trail at one time than I ever have before, three separate groups of hikers. Unfortunately, one of the groups had ill-behaved dogs with them. I have seen many dogs on the trail, and nearly all are used to the trail, passing hikers without much interest. These dogs were not like this, and their owners were irresponsible not to control such dogs upon approaching other hikers, especially ones with smaller children. As we were stopped by the side of the trail to let them pass, one of their dogs came running at top speed toward us, never a good situation. In fact, the last time this happened, I got bitten, which surprised me greatly since it had never happened before. I normally have a sturdy hiking stick with me when I hike alone, which would have been great to prevent problems, but since I was hiking with Matt, I didn't bring it. Fortunately, the dog was friendly, but he continually jumped up on us. Since he was the size of Matt, this could easily have knocked Matt over the side of the trail. I positioned myself between Matt and the dog, but the dog got in one such jump. Finally, the irresponsible owners got control of their dog. Matt had wanted to come on this hike, after spending nearly a week inside recovering from a bout with some flu-like sickness. He seemed well enough so I agreed he could come, but it turned out Matt didn't have his usual stamina this time. Hence we did a slightly shorter hike than originally planned, making it only partway up the first switchbacks, with considerable resting along the way. Matt had trouble only in ascending sections in full sun, even with the temperature only 74°. I have seen others have such problems, so it clearly is a problem for some people. Perhaps that is why it is claimed that the "optimal" temperature for hiking is in the 50s, at least for such people on such trails. For me, hiking in the 50s is just barely tolerable, and I draw the line at 50°! Fortunately, I had a good plan to accommodate Matt's reduced capability today: I marked a GPS waypoint at every bend in the trail, which required waiting 5 seconds at every such spot for my GPS (in its battery-saving mode) to update its position. I wanted to do this since I had previously found, much to my surprise, that the track stored by my Garmin Etrex receiver would sometimes be seriously deficient. In particular, on one recent trip, I had recorded waypoints that turned out to be quite accurate, but nonetheless fell over 1000' from the seriously-in-error recorded path. These data proved to be quite interesting - I learned that the Etrex software filters out short-term trail excursions of ~100' or less! I also stopped to do some light pruning along the trail, to allow Matt to rest up. I pruned some of the branches that were minorly leaning into the trail at miles 1.8 and ~2.0. Virtually nothing is blooming here now, except for a few last California buchwheat flowers that haven't turned red. This is a large contrast to the number of plants blooming in the San Gabriel Mountains now. One example: the wild cucumber in the San Gabriels is many feet long now, and has begun to bloom, whereas here only a few wild cucumbers have emerged from the ground, and are only 1-2' long at most. Not much trash had accumulated in the last month; for a change, I did not even fill one sandwich bag with trash. Although the weather has been quite hot in the past few days, this hike from noon to 5 pm turned out to be fairly pleasant. The temperature was 80-81° from the trailhead to the first ridge, but then dropped to 75° just below the first switchbacks at 1 pm. The temperature remained in the low 70s for the rest of my hike uphill. The trail crew had completely finished the Wild Horse Trail, including the small portion of the Dripping Springs Trail below the beginning of the Wild Horse Trail. They did an amazing job, clearing out a full 10' width in the section I observed at the bottom. I was worried that I had missed the striking bloom of the hoaryleaf ceanothus, but only a single plant (one stressed by the death of a number of its branches) was blooming. Most of the others had small buds, so full bloom is a month or so off. A little bit of rain does wonders - the black sage now looks vibrant and green, in marked contrast to the dead-looking, droopy leaves of a few months ago. The strong green growth of wild cucumber is in evidence in many places, with many of the plants in full bloom. The spike moss is mostly green. Even while some California buckwheat retain a few white flowers from last year, several plants are beginning to show off this year's bloom. Other flowers: in the campground, one manzanita is beginning to bloom and the shinyleaf barberry has yellow showing on its buds; on the trail, many manzanita have buds; mule fat is ending, sugarbush has buds; and white-flowered currant is in full bloom at 4000'. I made it up to the trunks blocking the trail at mile ~5.0, and pruned the small number of errant branches, especially those of whitethorn ceanothus, that now lie across the trail below that point to the stream crossing at mile ~3.8. The trail is now free of significant brush from the bottom to mile ~5.0 (there is still a bit of low brush just below the stream crossing that I intend to remove in the near future). I continued marking a GPS waypoint at every bend in the trail, beginning just below where I finished last time and ending at the stream crossing. The trash continues to be light. I filled only a portion of a sandwich bag, and found no bottles or cans on the trail. Last update: 22 December 2001.